Finally, weighing in at 422 pages, the third edition of Test, Evaluate, and Improve Your Chess: A Knowledge Based Approached has been published! This book is the third in a series that represents testing and evaluation of human and computer chessplayers for over 30 years. The original work started with the Bratko-Kopec Test in 1982 whereby 24 positions proved very effective in evaluating the leave of both human and computer chessplayers. This led to the development of five tests which comprised the 1997 first edition of this book. For the 2003 edition Kopec and Terrie added two tests bringing them to a total of 182 positions comprising seven tests. These tests are particularly knowledge-based covering all phases and all levels of chess play. The present edition, our third, adds five new tests, covering the openings including Novice (1000-1499) Intermediate (1500-1999), Advanced (2000-2199) and Super-Advance (2200 – 2700). A test covering the subtleties of King and Pawn Endings has also been added. The new 2013 edition also has the all the tests re-ordered by level of difficulty. All in all, there are 304 positions in this new comprehensive edition. 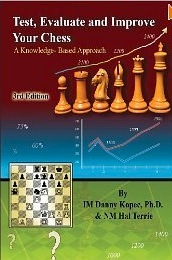 The book promises to be an excellent tool for self-study and for study of chess in classes. It is an invaluable tool for instructors. Or you can find it on Amazon.